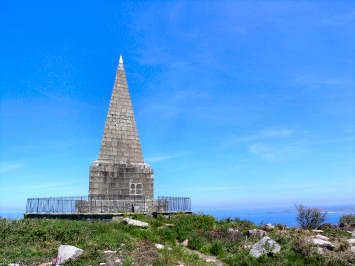 Like the Saints Way, St. Michael's Way has been around for some time and claims to be a logical route for ancient travellers heading from Ireland and Wales to avoid the perils of Land's End and the Scilly Isles. 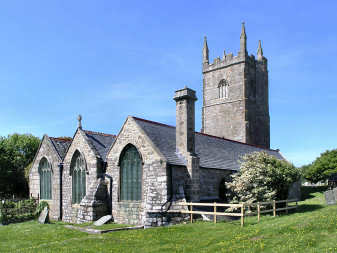 It begins at St. Uny Church at Lelant on the north coast and ends 12 miles later at Marazion on the south, opposite St. Michael's Mount. In fact travellers would have sailed up the Hayle estuary to St. Erth and had only five miles to Marazion - but that would hardly have qualified as a trail! 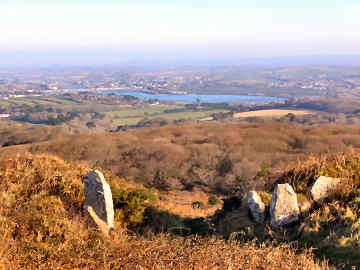 To make it a worthwhile distance, the trail first follows the coast path to Carbis Bay, then heads inland to Trencrom Hill, the halfway point. Do climb the hill for views. 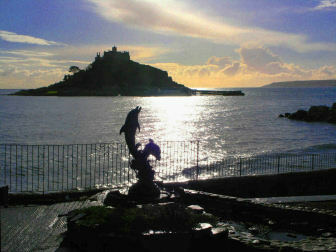 Then it's downhill all the way to Marazion. Easily walked in one go, using the First Kernow 17 bus between Lelant and Marazion, but I chose to do it as two round walks. As with the Saints Way, it is waymarked with its own sign, in this case a scallop shell. And, as with the Saints Way, the route is not always entirely clear, so best take Ordnance Survey Explorer sheet 102. In fact I parked at Lelant Saltings 'Park and Ride', about a mile from the start of the trail at St. Uny Church. 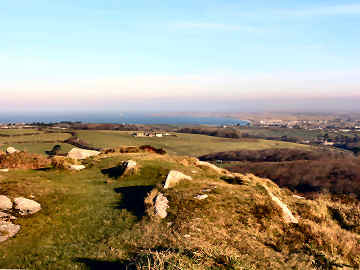 As far as Carbis Bay the trail follows the coast path before turning inland by Knill's Monument (views to Godrevy Light) and then lanes and fields to Trencrom Hill. 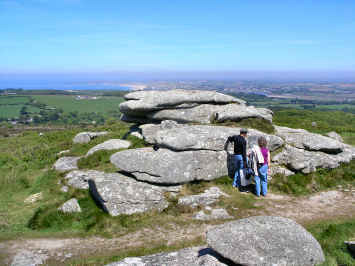 Although the trail is not signed up the hill, you should climb to the top (500 feet) to see the rocky tors, the hillfort remains and the views to Godrevy Light to the north and St. Michael's Mount to the south. I returned by lanes to Lelant Saltings. Jane's sister Mary, and her cousins Judith and Susan, came to stay for the Royal Cornwall Show in June. After the cousins had returned to Surrey, Mary and Jane fancied a day in Marazion. 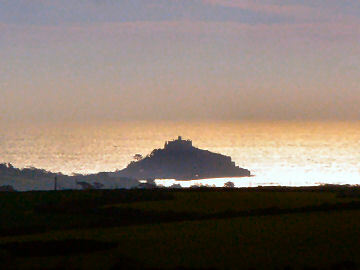 They dropped me at Trencrom Hill and I completed St. Michael's Way by walking to Marazion. 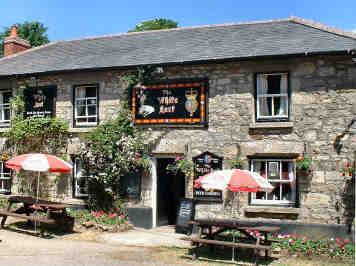 We met for lunch at the Godolphin Arms, walked the 3 miles along the seafront to Penzance and caught the bus back. 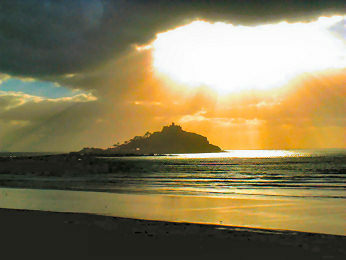 Weather was fine though views of St. Michael's Mount, visible from Ludgvan, were hazy. 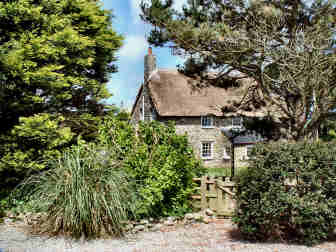 Easy walking, mostly across fields, broken by coffee in the White Hart in Ludgvan, an attractive pub with a good 'local' feel.